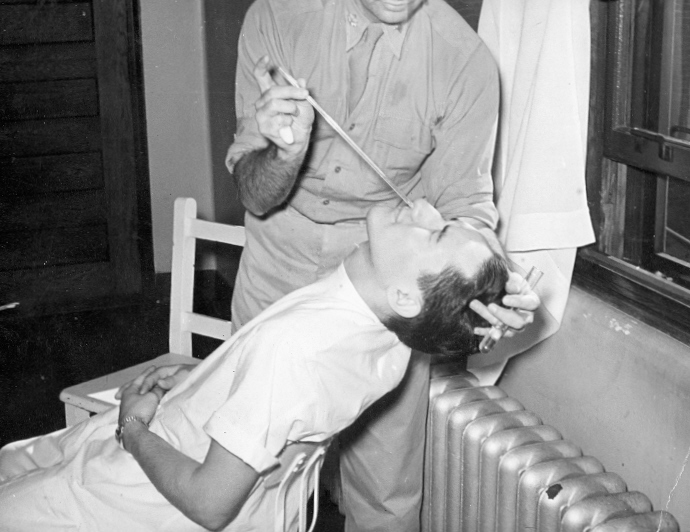 Major Havens injecting Dean C. Hoefle with material bearing infectious mononucleosis agents; May 23, 1945. Major Havens sub-cutaneously injecting G. Fred Trombley with material bearing infectious mononucleosis; May 23 1945. CPS Unit No. 68, a Mental Hospital unit at Norwich State Hospital in Norwich, Connecticut operated by the Brethren Service Committee, opened in March 1943 and closed in August 1946. The majority of the men served as ward attendants. The hospital served twenty-four hundred patients. Men at the Brethren Service Committee camps and units tended to report a mix of Brethren and non-Brethren denominational affiliations when entering CPS. The unit included some married men. Several of the men entered with professional and technical skills utilized at the hospital. The majority of the men served as ward attendants, although some also worked in clerical, agricultural, maintenance and construction, motor vehicle operation, technical and professional as well as food preparation roles. At Norwich State Hospital, men worked fifty-four hours per week. The men lived in single or double rooms. Eleven volunteers participated in a human guinea pig experiment with jaundice beginning in the summer of 1944. One of the volunteers, E. Kuszmaul, was in bed for forty days as a result of the inoculation, as reported in the unit newssheet This Issue. Another volunteer, Asa Mundell, described the effects of contracting infectious hepatitis. The following spring, four Norwich assignees volunteered to participate in an experiment to research infectious mononucleosis. The hospital superintendent William A. Bryan, concerned about public relations, followed the Selective Service policy of approving work outside the hospital if it was in compliance with the number of hours allowed and type of work permitted. These decisions proved difficult for men whose only source of income to support their families came from employment in off-duty hours. The strict enforcement also demonstrated the power of hospital superintendents in the mental health units. The Norwich paper, Norwich Bulletin, carried a series of angry letters about the CPS unit in early 1944 that asserted COS were being allowed vacations, could travel at will, held dances and parties in their rooms, and as compared to regular employees, “could get all the food they wanted”. These letters generated rebuttals from a number of sources. On April 20, 1945, the Norwich Bulletin published the findings of an investigation by The American Legion. The report not only identified the procedure for men declaring themselves as conscientious objectors, but also observed that “the COs are not pampered, but take a lot of abuse from the regular employees”. The report went on to refute allegations of special privileges and stated that CO wives “suffer much abuse and are denied many of the perks and privileges of civilian employees at the institution” (reported in Sareyan p. 122). The report contrasted sharply with the prevailing negative reactions about CPS units from related veterans groups. 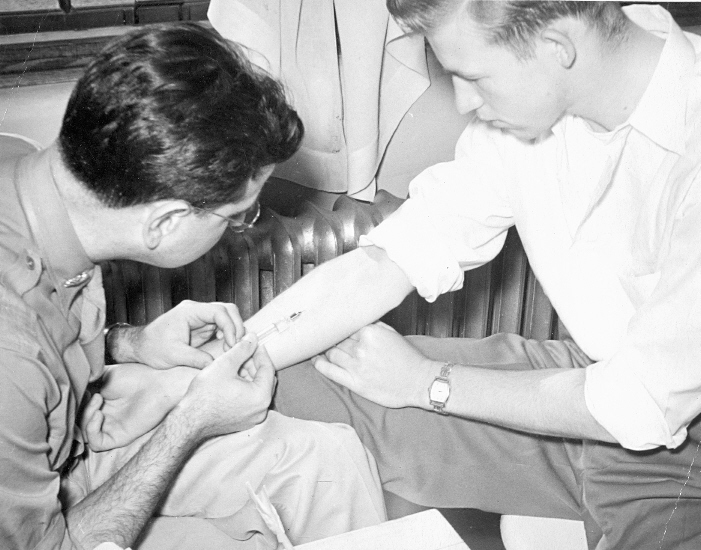 The hospital began an attendant training program for conscientious objectors in August 1943. In the three-month course, the hospital superintendent led the instruction, assisted by several hospital directors and assistant directors (nursing, psychological laboratories, clinical services, occupational therapy). COs received sixty hours of theoretical work combined with five hundred hours of practical work. However, by October 1943, as new COs arrived on an irregular basis, no such training was available due to personnel shortage. An effort was made, however, to give the new transfers some of the training provided for student nurses. The men published a paper called This Issue in December 1944. Weekly Memo was later published by the unit, and copies from January 1945 through January 1946 are archived in the Swarthmore College Peace Collection. Church of the Brethren Archives, Elgin, Illinois. For more in depth treatment on mental health units and training schools, see Steven J. Taylor, Acts of Conscience: World War II, Mental Institutions, and Religious Objectors. Syracuse, NY: Syracuse University Press, 2009.